Amazon.com: Film as Philosophy: Essays in Cinema after Wittgenstein and Cavell (9781403997951): R. Read, J. Goodenough: Books. 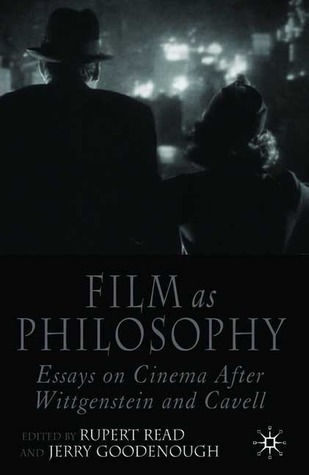 On Nov 29, 2005, Rupert Read (and others) published the chapter: Film as Philosophy: Essays on Cinema After Wittgenstein and Cavell in a book. But nor is it simply a coincidence that the authors in this collection, all of them powerfully influenced by Wittgenstein or Cavell or both, have developed the particular kind of interest in film that suited them  to being gathered under the auspices of the title 'Film as philosophy: Essays on cinema after Wittgenstein and Cavell'. With a foreword by Jean-Luc Nancy Philosophy and the Patience of Film presents a comparative study of the work of Jean-Luc Nancy and Stanley Cavell. It discusses the effect of their ... ... In Rupert Read & Jerry Goodenough (eds. ), Film as Philosophy: Essays on Cinema After Wittgenstein and Cavell. Palgrave-Macmillan.